Many people with AMD have deposits under the retina called drusen. Drusen alone usually do not cause vision loss, but when they grow in size or number, there is an increased risk of developing advanced AMD. 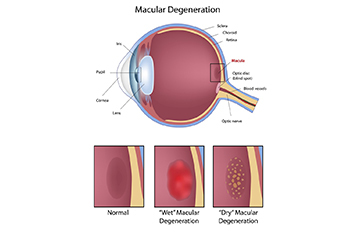 People at risk of developing a late stage of AMD may have a large amount of drusen or they may have abnormal blood vessels growing beneath the macula in one eye, which can bleed and cause loss of vision. 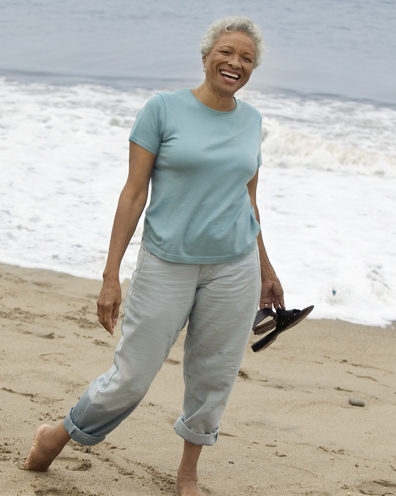 We know that Early detection, diagnosis and treatment of AMD leads to better visual outcomes. Unfortunately, most people with AMD don’t recognize the problem immediately, since vision loss usually occurs in one eye first, and can take place over several weeks or months; most people with AMD may not recognize the problem immediately. As a result, up to 80% of people don’t visit their eye care professional until it is too late to protect the sight in the affected eye. To catch vision loss early, regular eye exams are very important, especially for patients at an increased risk of disease progression. When you understand your risk, you and your eye care provider can develop a program that best manages your disease. Monitoring and treatment can begin before your symptoms progress, enabling you to achieve the best vision outcome. Macular pucker is a condition that results from a residual membrane that grows on the retina from an age-related change in the gel (known as the vitreous) in the back of the eye. This membrane then wrinkles the retina causing a distortion in the central vision. This can make it difficult to read or see faces and road signs. Macular pucker can be treated. Your eye is filled with a gel-like substance called vitreous, which lies in front of the macula. As you age, the vitreous gel shrinks and pulls away from the macula, usually with no negative effect on your sight. In some cases, however, the vitreous gel sticks to the macula and is unable to pull away. As a result, the macular tissue stretches. After several weeks or months a hole may form in the maculae. In the early stages of a hole formation, your central vision may be unaffected, however if the hole progresses, a blind spot develops in your central vision and impairs the ability to see at both distant and close range. A macular hole may be repaired with Vitrectomy surgery. Cystoid macular edema, commonly called CME, is a disorder that affects the retina. CME is the presence of multiple fluid-filled, cyst-like (cystoid) structures in the macula, the central part of the retina responsible for central (detail) vision. The result is swelling (edema) of the macula, most commonly from inflammation. This inflammation can occur from a number of conditions, but can be treated. Dr. Netan Choudhry is our preferred provider for vitreoretinal services. For vitreoretinal inquiries or to schedule an appointment at his office, please visit Vitreous Retina Macula Specialists of Toronto (VRM Toronto) or call 647-361-7575. Schedule your complimentary consultation today and start the process toward better vision!